Rare opportunity for new construction in the Red Clay SD 19808! The location, off Newport Gap Pike, on a quiet little street but close to all of the popular 19808 spots offers the perfect lifestyle of convenience and private retreat. This model provides an open and contemporary feel while not skimping on rooms. Center hall is flanked by the living room, which is open to the family room and showcases character-adding pillars. The family room is such a comfortable place to relax and enjoy a fire in the elegant fireplace. The fantastic kitchen featuring granite, stainless and versatile island space makes whipping up meals so enjoyable. For special occasions, take those meals to the formal dining room. You've dreamed of a master suite like this! It's bright and huge enough to customize a sitting room, reading nook or whatever you choose. You cant miss the 2 walk in closets! Luxurious bathroom with a vanity dedicated to each owner, awesome soaking tub and large shower stall. The additional three bedrooms area wonderfully laid out and share a great full bathroom in the hallway. Upper floor laundry grants your wish of convenience! The basement is clean, bright and offers egress, just in case you design a finished area in the future. The exterior with beautiful stone accent and siding and quaint front porch makes for swoon-worthy curb appeal. If the current homes in the price range have been a let down, this quality (to be) built new home complete with high end finishes will check off all boxes on your wish-list. 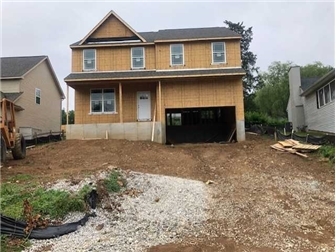 Even better, 100% financing is also available on this home! Photos are of a similar home. Home is not yet built. This home will be a garage-right layout.